The Northern Patagonian Icefield in the Andes Mountains in Chile is a remnant of an ice sheet that covered the region about a million years ago. Though much smaller today, it is still one of the largest temperate (mid-latitude or non-polar) icefields in the world. Twenty-eight exit glaciers flow out of that field, and San Quintín is the largest. 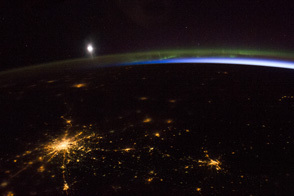 The image above was captured by the ISERV Pathfinder instrument, an experimental camera system in the Destiny module on the International Space Station (ISS). The instrument captures photographs of natural hazards, environmentally threatened regions, and areas of historical or cultural importance. 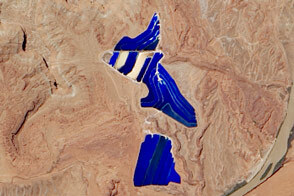 On June 2, 2014, ISERV snapped eight images of San Quintín that were made into a mosaic; the image above was cropped from that scene. Download the large image for the full view. 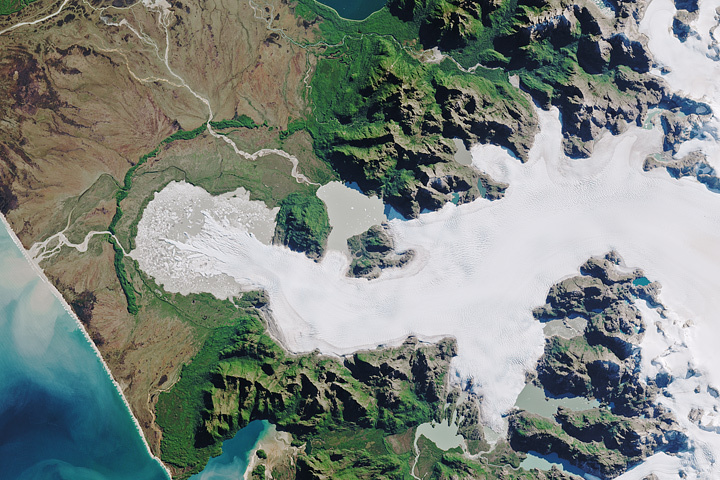 San Quintín Glacier is situated within Laguna San Rafael National Park and drains west toward the Pacific Ocean. The terminal end of the glacier (left in this image) meets a lake that gets its beige color from glacial flour—the pulverized rock that is ground up by the moving ice. In the photo, hundreds of icebergs surround the glacier’s end, while a stream flows west toward the Golfo de Peñas on the Pacific Ocean. Scientists have been monitoring San Quintín, nearby San Rafael, and other glaciers in this icefield because they appear to be losing a significant amount of mass. Astronauts flying on the space shuttle captured images of the same area in 1994 and 2002; click here to see those images. NASA image from ISERV Pathfinder, SERVIR program. Caption by Mike Carlowicz. 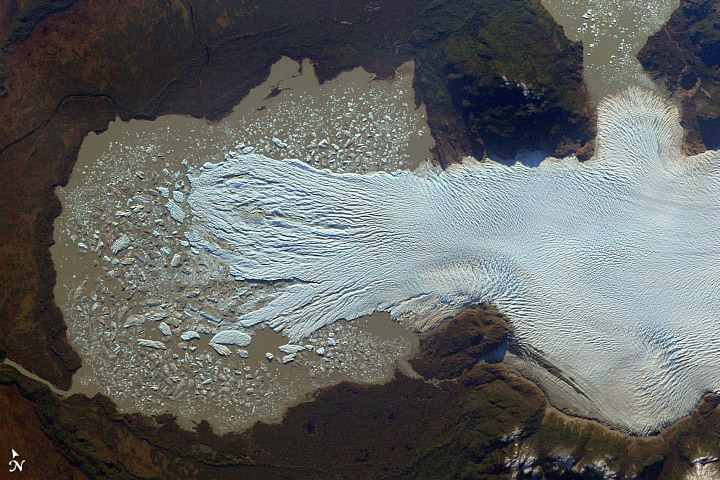 The largest outflow glacier in the Northern Patagonian Icefield appears to be shrinking. Willis, M.J. et al. (2012) Ice loss rates at the Northern Patagonian Icefield derived using a decade of satellite remote sensing. 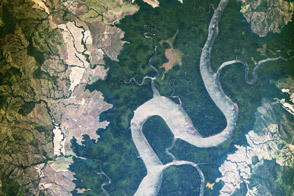 Remote Sensing of Environment, 117, 184-198.